It’s official, folks. The Portland Trail Blazers will have at least one participant in All-Star Weekend. 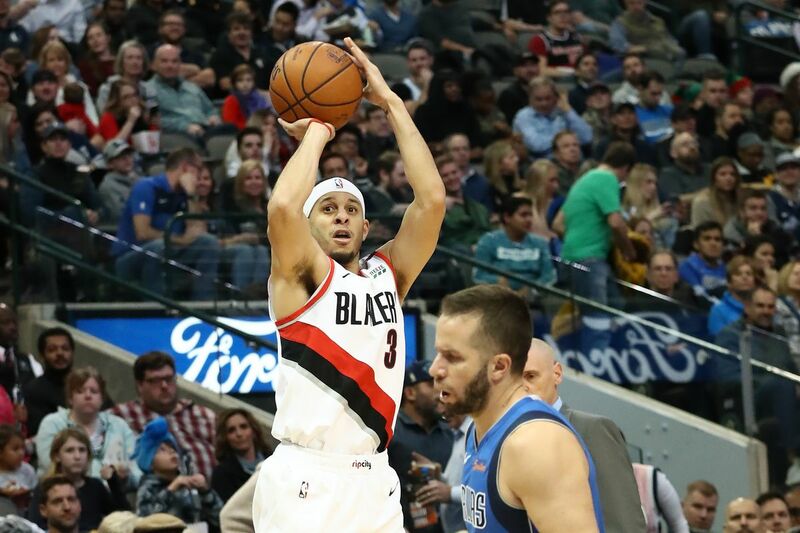 As ESPN.com’s Adrian Wojnarowski reported late last week, Seth Curry will be shooting his shot on All-Star Saturday Night in what’s really become the most exciting event of the NBA’s annual (unofficial) midseason break. Curry is a lights-out shooter from distance knocking down 48.1 percent of his deep looks, and the only complaint this season is that he’s just not doing enough of it. He’s the second-best shooter in the league as far as percentage from the three-point line goes, and yet he’s only seeing 2.8 attempts per contest. Although there’s an entire discussion to be had about how the Blazers could better utilize Curry, the franchise should be plenty pleased that the league recognizes that the 28-year-old belongs in the spotlight. Yes, the fact that it’s in his hometown of Charlotte and that his brother, Steph, will also be participating makes it a bit easier for the league to call his number. But anyone who thinks his inclusion was a gimmick and a gimmick alone is about to see just what “the other” Curry can do. Anfernee Simons has only played in 10 games for a total of 57 minutes. On merit alone, the Blazers’ youngest player doesn’t belong anywhere near this exhibition, which is going to feature the likes of Luka Doncic, Deandre Ayton, Kevin Knox and others with legitimate All-Star potential. But when it comes to ceiling and excitement, Simons belongs because of his quick shot, transition abilities and major bunnies, even if his 1.5 points-per-game average and negative PER don’t show it. The best part? A lighthearted, fast-paced competition would get this kid some confidence. In two games down in the G-League, Simons has posted an impressive 23.5 points per game in 27.5 minutes per contest. He’s shooting 52.2 percent inside the arc, 46.7 percent from behind it, and if that number isn’t solid enough for you in a vacuum, here’s some context: He’s taken 7.5 deep balls per game. Clearly, in the right setting, Simons isn’t shy. He’s still a year away from being a year away (at best), but seeing him get some run—and amongst his more NBA-ready peers, nonetheless—could do wonders when it comes to expediting his improvement just a bit. According to Basketball-Reference, CJ McCollum is a combo guard no more. The 27-year-old, who has made a career out of handling the ball, has actually played fewer and fewer minutes at point guard over the past few seasons. This year, he’s down to less than one percent of his total minutes played at the 1; he’s played 63 percent of his minutes at the 2, a career-high 36 percent at the 3 and an astonishing one percent at power forward. That’s right—according to the mecca of basketball statistics, Portland’s “combo guard” has played more minutes at the 4 than at the 1 this season. None of that, however, changes the fact that this dude has control over the rock like few others. Although he’s gained some notoriety for CJ’s Victims Unit, McCollum isn’t universally recognized as a killer crossover machine. He’s an adept passer and floor general who is one of the best in the league at keeping the ball on a string, but he doesn’t have the House of Highlights handles like Steph or Kyrie. What’s the difference? No flash necessary. For CJ, it’s about getting from point A to point B efficiently. If a defender happens to bite, so be it. Damian Lillard is a two-time champion in this contest, but we have a different event in mind for the Blazers’ starting point guard. It’s time for CJ to get his own title here. As much of a case could be made for someone like Anfernee Simons, Jake Layman can get UP. Although we haven’t seen a lot of trickery from the Maryland product, the vertical, the force and quite frankly the unexpectedness every time the 6’9” forward finishes above the rim blows people away. The Blazers have only had five players ever participate in the Dunk Contest (Clyde Drexler, Jerome Kersey, James Robinson, Rudy Fernandez, Damian Lillard), and while Layman would compete with Robinson for prominent “who’s that guy” status across the league, in Portland he’s developed something of a cult following. Here’s the catch: Layman would need a crafty passer on his side considering out of his 30 dunks on the year, 29 have been assisted (the fourth-highest %AST’d in the league). Although Lillard is the guy typically tasked with getting everyone else involve, the Nurk-Layman Connection is a real thing. Get the Bosnian Beast out there throwing elbow passes and anything can happen. With apologies to the criminally underrated McCollum and an engaged, productive Nurkic, there’s only one answer here. Damian Lillard is an All-Star. There’s really no debating it. Although the fans will never likely vote him in unless he wins a championship or finds himself playing in a bigger market, the coaches should consider him a perennial selection at this point. Lillard is an All-Star. We’ve said it already, but it can’t be said enough. Lillard is an All-Star. Now we just need to wait for the announcement on Thursday. From playing football at Westview HS to currently killing the standup game and writing for The Late Late Show with James Corden, Ian Karmel has made Portland proud throughout the years. This extends to the hardwood, as the 34-year-old used to do Trail Blazers analysis for CSNNW through a comedic lense—really the only way watch the Blazers year after year without falling into a great depression. Although we’ve never seen Karmel play, we imagine he shoots approximately 67 percent from deep, has the skillz of OG Tim Hardaway and can throw it down like Russell Westbrook. Even if none of that is true, his sheer ferocity with the ball in his hands must resemble Russ, but with, like, the ability to also force defenders into the fetal position via some funnies. And for that alone, we need this man in this game.